The wait is over. Mortal Kombat X, the heavily anticipated sequel to 2011's Mortal Kombat game, has finally been announced earlier this morning by Ed Boon. Warner Bros. has now sent out a Press Release for the game which confirms the game will be shown for the first time at next week's E3 2014 in Los Angeles, California. TRMK will be in Los Angeles to check it out first hand! Check back next week for updates and information on the tenth installment in the Mortal Kombat franchise! Be sure to send us any questions you have too, so we can try to get them answered by the developers from NetherRealm on hand. As aways we always recommend tuning into the big three platform's Press Conferences as well incase the game is featured there, but you can count out Nintendo who's Wii U platform was not listed as an option for the game at this time. Check out IGN's Guide on the 2014 Press Conferences for dates and stream links. Warner Bros. also confirmed the Amazon leaks that the game is being developed for the PlayStation 4 and Xbox One Next-Generation consoles by NetherRealm Studios. Additionally if you don't have one of the new consoles the game will also be ported to Windows PC as well as previous generation consoles Xbox 360 and PlayStation 3. The game will arrive in 2015, and I'd anticipate a more specific release date sometime early next year. 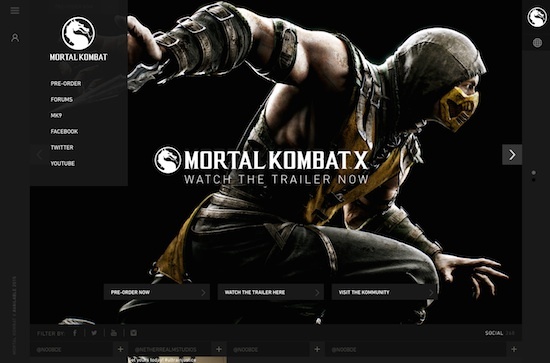 The Mortal Kombat X website has also been launched at MortalKombat.com. It features some new high resolution character artwork not seen in the trailer. Here's a screen capture of the website below, as the site is having problems this morning. Also featured on the site is a nice rundown of the "objective" of the game and it's Next Generation focus and a new online mode that is "fully-connected" and "persistent". Plus you can choose from various fighting styles again? Can't wait to hear more at E3! Burbank, Calif. – June 2, 2014 – Warner Bros. Interactive Entertainment today announced Mortal Kombat X, NetherRealm Studios’ next highly anticipated installment in its legendary, critically acclaimed fighting game franchise that propels the iconic franchise into a new generation. Mortal Kombat X is scheduled for release in 2015 for the PlayStation 4 and PlayStation 3 computer entertainment systems, Xbox One, the all-in-one games and entertainment system from Microsoft, the Xbox 360 games and entertainment system from Microsoft and Windows PC. Mortal Kombat X will make its first public appearance at Electronic Entertainment Expo (E3) 2014 in Los Angeles. For more information about Mortal Kombat X, please visit www.mortalkombat.com and www.facebook.com/MortalKombat. Sweet baby jesus, that trailer was on point. One can only hope the camera works like that in game! This is GREAT NEWS, I'm pumped for E3 now! Hmmmm, Looking forward to TRMK's thoughts first hand when they experience the game...Should be worth it.